Serial extraction is a sequential plan of premature removal of one or more deciduous teeth in order to improve the alignment of permanent teeth and then removal of permanent teeth to maintain the proper ratio between tooth size and arch size. The aim of this case report was to present a case treated successfully with a modified serial extraction protocol in the lower arch because the patient had congenitally missing lower second premolars with severe crowding. The treatment consisted of selective removal of the deciduous mandibular teeth only (C, D, and E) and no permanent premolar removal. However, the space of the missing second premolars was utilized to resolve the anterior crowding along with the spontaneous closure of the extra spaces by physiologic movement of the permanent mandibular teeth. Whereas in the upper arch conventional serial extraction was performed. Objectives: The objective was to compare dentofacial characteristics of Class I malocclusion in Saudi and Japanese adult females. Materials and Methods: Lateral cephalograms of 50 Saudi adult female and 50 Japanese adult female (18-35-year-old) were obtained. All patients were skeletal Class I, angle Class I malocclusion, arch length discrepancy (−10-10 mm), overjet (1-5 mm), overbite (1-5 mm), absence of congenital anomalies, or significant facial asymmetries or congenitally missing tooth other than the 3 rd molar and absence of temporomandibular joint problems. Patient cephalograms were traced and digitized. 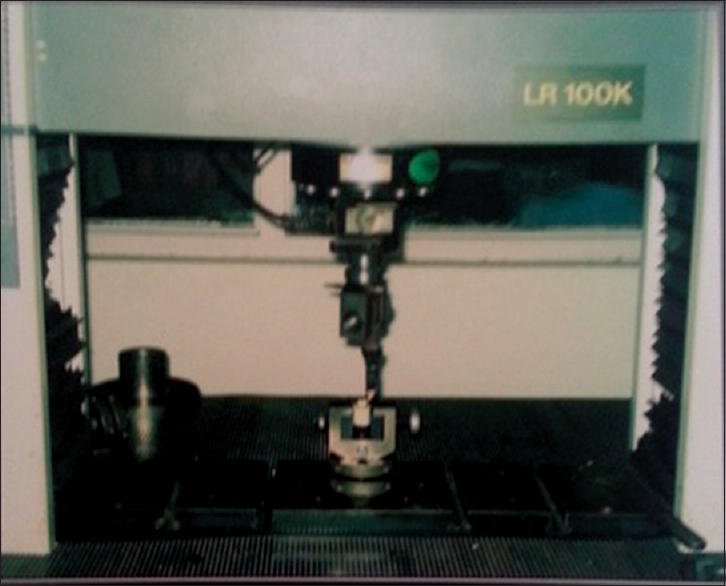 16 angular measurements and 13 linear measurements of facial form were used. Results: A comparison of the vertical dimension showed that the Saudi females had a significantly larger gonial angle, a significantly larger facial angle and longer lower face height compared to the Japanese females. Dentally, Saudi females had more protruded incisors with increased distances of the posterior teeth to the palatal plane. For the soft tissue dimension, the Saudi subjects had a significantly more prominent nose, retruded lip and a more protruded chin compared with Japanese. Conclusions: There were significant differences in dentofacial morphology between Saudi and Japanese adult females. Both Asian countries have distinct cephalometric features, which should be considered as a reference in treating patients of varying ethnic backgrounds to optimize the final results. Objective: The objective was to evaluate the Bolton ratio in a North Indian population in Lucknow with different malocclusion. Materials and Methods: Totally, 110 study cast [Age: Female (14.2 ± 1.5 years, Male (13.9 ± 2.3 years)] were taken from the patients undergoing orthodontic treatment and Subjects were divided into three groups: Group I (Angle's Class I, n = 40), Group II (Angle's Class II, n = 50) and Group III (Angle's Class III, n = 20) according Angle's classification of malocclusion. The mesiodistal widths of all maxillary and mandibular teeth from right first molar to left first molar were measured with a digital caliper to calculate the Bolton ratio. The readings were then used to compute the anterior and total Bolton ratios. ANOVA and Tukey's test were used for the statistical analysis. Results: A mean total Bolton ratio of 91.36 ± 2.13 and a mean anterior Bolton ratio of 78.14 ± 4.09 were found for the sample, Significantly higher mean anterior tooth ratios were found for Group II (Angle's Class II) patients (P < 0.01). All other ratios were within close range of Bolton's norms. Conclusions: Angle's Class II patients showed a tendency toward wider mesiodistal widths of teeth in the mandibular anterior region or smaller tooth sizes in the maxillary anterior region. Background: The study of the mesiodistal size, the morphology of teeth and dental arch may play an important role in clinical dentistry, as well as other sciences such as Forensic Dentistry and Anthropology. Aims: The aims of the present study were to establish tooth-size ratio in Sudanese sample with Class I normal occlusion, to compare the tooth-size ratio between the present study and Bolton's study and between genders. Materials and Methods : The sample consisted of dental casts of 60 subjects (30 males and 30 females). Bolton formula was used to compute the overall and anterior ratio. The correlation coefficient between the anterior ratio and overall ratio was tested, and Student's t-test was used to compare tooth-size ratios between males and females, and between the present study and Bolton's result. Result s: The results of the overall and anterior ratio was relatively similar to the mean values reported by Bolton, and there were no statistically significant differences between the mean values of the anterior ratio and the overall ratio between males and females. The correlation coefficient was (r = 0.79). Conclusions : The result obtained was similar to the Caucasian race. However, the reality indicates that the Sudanese population consisted of different racial groups; therefore, the firm conclusion is difficult to draw. Since this sample is not representative for the Sudanese population, hence, a further study with a large sample collected from the different parts of the Sudan is required. Objectives: The objective was to assess the shear bond strength (SBS) of composite resins on stainless steel brackets immediately bonded to previously bleached teeth with 35% hydrogen peroxide and to compare the neutralization effect of various antioxidant agents on the bond strength after bleaching. Materials and Methods: One hundred sound human maxillary premolars were used for the study. Teeth were divided into 5 groups (n = 20); Group 1 (control), Group 2 (bleach treatment), Group 3 (sodium ascorbate treatment), Group 4 (tocopherol acetate treatment), and Group 5 (retinol acetate treatment). Teeth in Group 3, 4, and 5 were treated as in Group 2, but after that and before bleaching received treatment with sodium ascorbate, tocopherol acetate, and retinol acetate, respectively. Subsequently, teeth were bonded with stainless steel brackets (Ormco) using 3M Transbond XT. After 24 h, each specimen was loaded into a universal testing machine to determine the SBS at debonding. The data were exposed to the analysis of variance, Bonferroni, and Weibull Analysis. Result: There significant SBS difference (P = 0.000, F = 32.125) between various groups. Group 1 had the highest SBS (12.182 ± 1.41 MPa) and Group 2 the least SBS (6.182 ± 1.49 MPa). Significant SBS differences observed between Group 1 and 2; Group 2 and 3; Group 2 and 4; and Group 2 and 5 (P = 0.000). There was no significant SBS difference between Group 1 and 3; Group 1 and 4; and Group 3 and 4 (P = 1.000). Bonferroni results also indicated that there was a significant difference between Group 1 and 5 (P = 0.002); Group 3 and 5 (P = 0.144); and between Group 4 and 5 (P = 0.008). Weibull analysis indicated that bond strength for a 90% probability of failure, which was highest for Group 1 (13.99 MPa) and lowest for Group 2 (8.49 MPa). Conclusion: The in-vitro study showed that bleaching with 35% hydrogen peroxide reduced the SBS significantly and this could be effectively reversed by the application of 10% sodium ascorbate, 10% tocopherol acetate, or 10% retinol acetate. Thus, treatment of bleached teeth with antioxidants can be a good clinical option for bonding immediately after bleaching. Background: Rapid palatal expansion is one of the most important orthopedic treatments that correct the dental and palatal constriction. Stability of the changes partly depend on the rapidity of new bone formation in affected sutures after expansion. The purpose of this study was to investigate the effect of laser irradiation on the healing of midpalatal suture concurrent to the expansion of midpalatal suture in rats. Materials and Methods: A total of 78 male Sprague rats in seven groups were evaluated: A control group of six rats without any treatments and three experimental groups of 24 which underwent palatal expansion for different time periods (7, 14, and 30 days), and each divided into two groups of with and without laser irradiation. Laser therapy was done by gallium-aluminum-arsenide diode laser with 810 nm wavelength and 4 J/cm 2 irradiation in days 0, 2, 4, 6, 8, 10, 12, 14 in 4 points (1 labial and 3 palatal points). After sacrificing, the sections were evaluated by histomorphometric and quantitative analysis and results were statistically investigated by independent samples t-test. Results: The results in 7 days, 14 days, and 30 days show that laser therapy can increase the rate of osteogenesis in palatal suture during rapid palatal expansion but the differences in 7 days groups were not significant (P = 0.117) while in 14 days groups (P = 0.032) and 30 days groups were significant (P = 0.001). Most of effectiveness of low-power laser was seen between 14 and 30 days while the laser therapy was stopped. Conclusion: These findings suggest that low-level laser irradiation can increase and accelerate bone regeneration in the midpalatal suture after rapid palatal expansion, hence, reduce retention time. Objective: The aim of this cross-sectional study was to compare craniofacial growth among operated and unoperated unilateral cleft lip and palate non-syndromic subjects. Materials and Methods: A sample of 180 subjects of Indian origin was selected. Of them, 90 were operated, and 90 were unoperated complete unilateral cleft lip and palate individuals. The subjects were divided into three age groups of 3-5, 8-10, and 20-25 years comprised of 30 patients in each group. 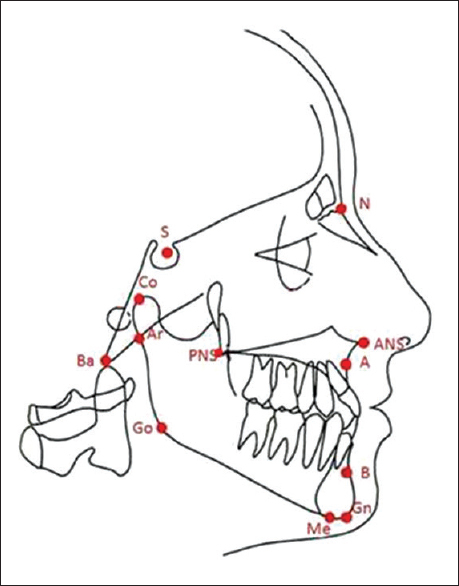 The following measurements were evaluated: Angle and length of the cranial base; maxillary spatial positioning and length; mandibular spatial positioning; morphology and length; maxillomandibular relationship. Comparative analysis of the means between the groups was performed with Student's t-test at the significance levels of 5%. The ANOVA test has been performed to test the effect of time. Results: No significant differences were observed between the measurements that represented the angle and length of the cranial base of unoperated and the operated patients (P>0.05). There was statistically significant decrease ( P˂0.05) in the maxillary length (Co-A; 69.00 mm in 3-5 years, 68.33 mm in 8-10 years, and 67.17 mm in 20-25 years age group), and SNA angle (74.83Ί in 3-5 years, 74.17 Ί in 8-10 years and 73.17 Ί in 20-25 years age group) in operated group. No significant difference noticed on cephalometric values of the mandible, except Ar-Go-Me angle ( P˂0.05), which showed vertical growth pattern in unoperated patients (132.50 Ί in 3-5 years, 132.00 Ί I 8-10 years and 138.33 Ί in 20-25 years age group). 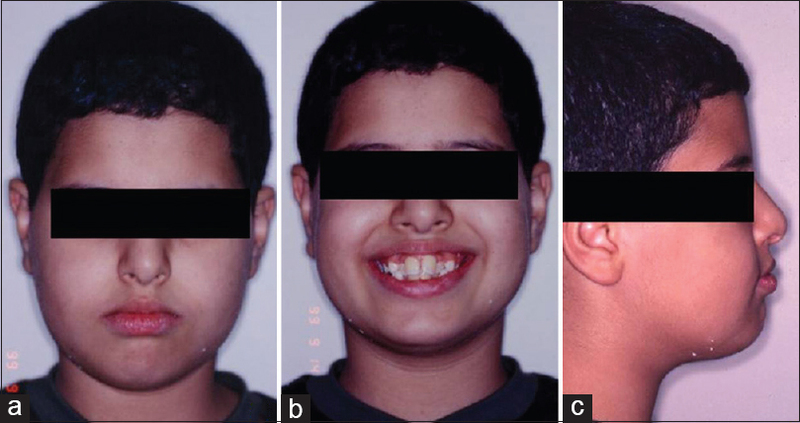 Conclusion: Lip and palate repair has a significant influence on the maxilla and resulting in retarded growth of maxilla, which causes midface deficiency beyond acceptable sagittal limits. 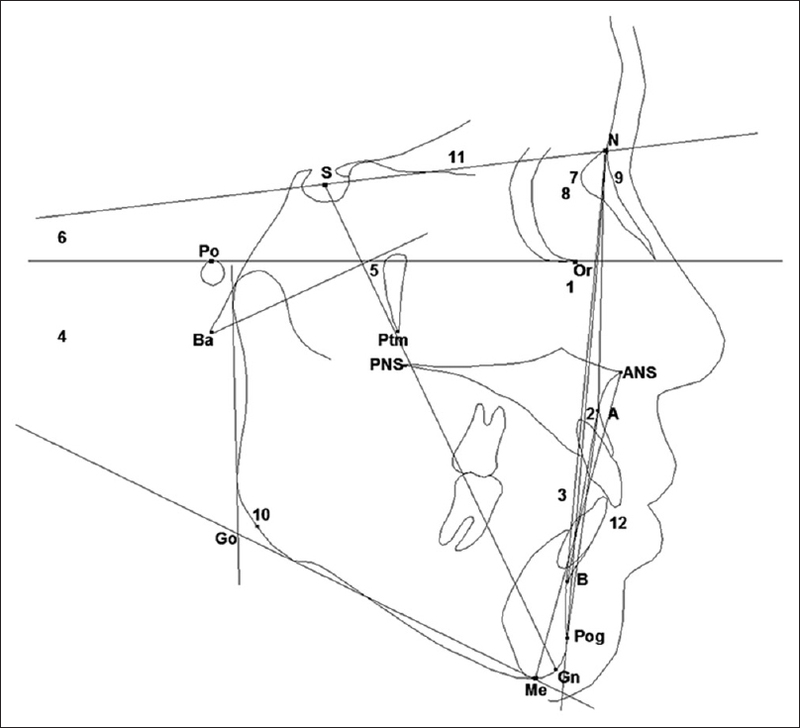 The Gonial angle showed vertical growth pattern in unoperated patients, but the cranial base angle and length of unoperated and the operated patients were similar.